But he took a damned ugly path to get there. 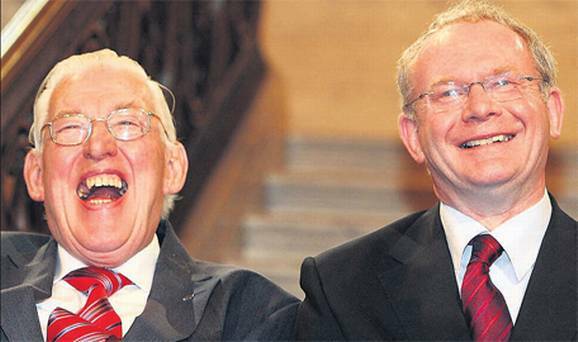 Paisley’s path was certainly no more or less convenient than the manner in which McGuinness and Sinn Féin pushed aside the more moderate Social Democratic and Labour Party (SDLP) and its longtime leader John Hume, who shared the Nobel Prize with Trimble for the 1998 peace accords. Today, in the Northern Ireland Assembly at Stormont, the DUP holds 38 seats and Sinn Féin holds 29, far outmuscling the UUP (13) and the SDLP (14), junior partners in the power-sharing government, lingering as phantoms of a different era. But even as tributes pour in from former adversaries like Sinn Féin leader Gerry Adams (incredibly declaring Paisley the ‘no’ man who said ‘yes’), and commentators celebrate Paisley’s final act in Ulster politics, today is a day to celebrate the death of Paisleyism, even while Irish republicans memorialize the man himself. ‘Holy smoke and stinks.’ Good grief. Paisley brought to Northern Ireland politics an intolerant brand of bluster that had as little respect for constitutionalism, the rule of law, individual freedom and freedom of religion as it did for Catholicism and the Irish republican movement. He did so with the force of right-wing paramilitary units that resorted too often to violence in the 1970s and the 1980s. He called the moderate Hume a ‘pretender to democracy,’ while his Protestant thugs were content to deny basic civil rights to Ulster Catholics. That’s not to absolve his enemies. Sinn Féin and the Irish Republican Army have as much blood on their hands, and Adams, even during the last European election campaign, was handicapped by the fallout of his role in shameful murders from four decades ago. Likewise, Sinn Féin today remains committed to republicanism, but in the Republic of Ireland, it’s become more popular as a social democratic voice against orthodox austerity policies, under a new generation of leaders like Mary Lou McDonald. That’s all a good thing — for both Northern Ireland and the Republic of Ireland. But it took far too long to reach this point.